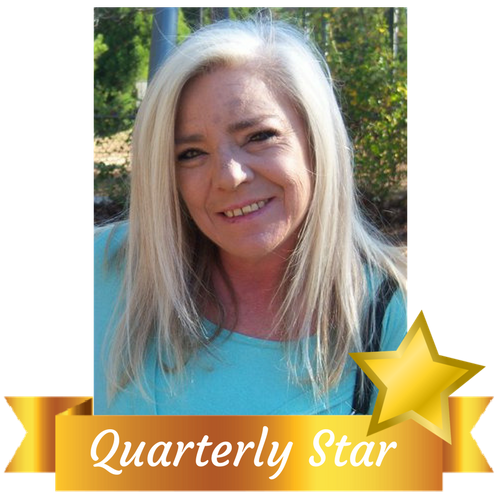 Maid in America is proud of our Quarterly Star ~ Sharon! She hails from Mableton but lives in Dallas with her three girls – ages 17, 24,and 34. She treats her clients like family and her clients feel the same about her! When Sharon is not helping her girls she enjoys gardening and evening walks and loves to fish! Sharon is also a dog lover! She is doggy mom to a Jack Russell, a Mini Doberman and 2 Huskies! With such an active doggy family she definitely loves her evening walks! Sharon believes that if you “do good then good will come to you.” We see that everyday when working with Sharon. She is so good to her fellow teammates and her clients. She knows life is stressful and she strives to take some of the stress from her clients. She knows that coming home to a clean house is just one of the ways she can help her clients to relieve their stress. Sharon’s biggest cleaning tip to disinfect germs where they are most concentrated – i.e. sinks and toilets. Spray them with a mist of white vinegar then spray them with hydrogen peroxide – but don’t mix them together in the same bottle – do it separately. This will help those places to stay clean and free of germs. Congratulations to Sharon – our shining Quarterly Star!